Strozzapreti are a typical pasta of Romagna. Our Strozzapreti are handmade, gluten free, egg free, milk free and preservative free. This ready-made first dish has a frivolous racket and bacon sauce. You can warm it in a couple of minutes in the microwave, with no contamination risk: you do not need to open the package. 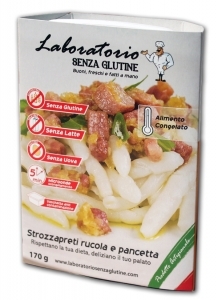 Rice flour, arugola 15%, potato starch, bacon, onion, extra virgin olive oil, sunflower oil, guar flour (E412).